Last Saturday, Lauren and I were having beer & pizza tonight. Had ordered a pizza and wanted to pick up some beer on the way to picking up the pizza. Stopped at speciality beverage store BevMo. 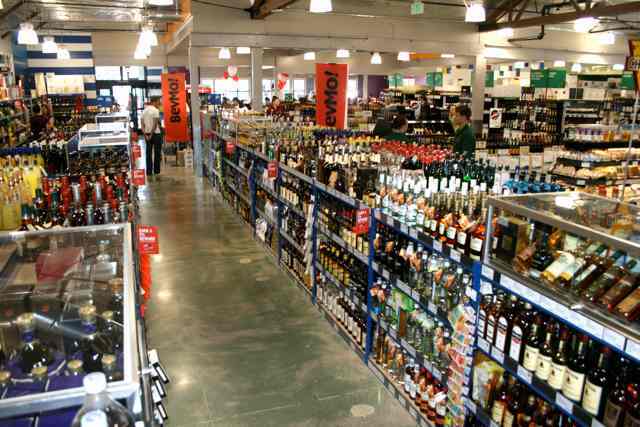 If you haven’t been to BevMo, it’s the size of a small grocery store filled with wine, beer, and liquor of all shapes and sizes. If you’re a craft beer fan like myself, this is a great place to find breweries that you’re not going to find at your typical grocery store. But here in lies the problem. There are too many beers. It’s hard to decide what you want. I can easily sit for 15 minutes going through the aisles being totally frozen in indecision as I try to decide on region of the world, lager vs ale, light vs dark, cheap vs reasonable vs expensive, and hoppy vs not. You see similar overwhelmed faces when you patronize my favorite beer bars like DC’s ChurchKey & Bier Baron. You see the 50+ taps with delight. It all changes when the waitress hands you the binder of a beer menu. You just page through all the options and wonder where you should start first. I almost want these beer mecca’s to have their own iPhone app, where they knew what I liked and made recommendations. If it’s at a restaurant, the beer app could take into consideration what I’ve already drank that evening or what aspect of the meal that I’m in. A very bitter beer could nuke my palette and spoil my ability to taste a meet. So I should probably steer clear till the dessert course. We see this phenomenon not just in beer but in a lot of things. For example in online, we’ve given everyone the ability to publish whatever they want online. To look at my wife’s company Umba Box, sites like Etsy have given everyone the ability to publish their store to sell their handmade goods. It’s awesome BUT… this means there’s a lot of crap being sold online and there are just TOO many choices. We need someone like Lauren & Umba Box who can come in and make recommendations for the best handmade products to buy. If you’re angel investor, keeping track of all the new startups that pop up on a daily basis is darn need impossible. There are just too many out there. Sites like Angel List help curate and let you track the best of what’s out there. Foursquare’s another one that helps you tackled a crowded world. They use the check-in data from their users to help figure out where are the hidden gems of restaurants, cafes, pubs, and bistros for you to patronize. When you’re traveling its an amazing way to figure out the cool places to eat & drink. Pinterest is the ultimate in helping you discover what’s out there. The entire premise of the application is around users making lists/pin boards of the things that people love. And… it’s taken off. We live in a crowded world. There’s lots of room for innovation around helping us navigate it. Previous Previous post: Make products people love. Next Next post: Surprise and delight your users. Give them chocolate chip cookies.